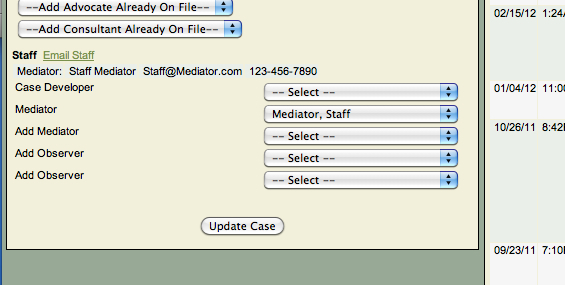 In a case record, mediators now have basic contact information for their comediators. For admins, this is linkable, meaning that for administrators with full access this person's name is a hyperlink which will open that staff person's file. For the rest of the staff, this will display their email address and phone number. This will help comediators to be able to contact each other. If a mediator does not want their information to be shared, then they should delete their contact info or move it to the notes field (not viewable by other mediators).